Cold tolerant plants for outdoor gardening, most to Zone 5. All the below listed plants are in addition to the list on the web and in the 2002 paper catalog which is still being used. If you need to see which Zone you live in check out one of these maps: Eastern USA, Western USA. 23665 CRASSULA SEDIFOLIA $4.50 Close, dense pads of congested rosettes of tiny bronzed fleshy leaves and heads of small white flowers. 23751 JOVIBARBA "EMERALD SPRINGS" $4.50 Sempervivum look alike. 23656 JOVIBARBA "OLYMPICUM" $4.50 Sempervivum look alike. 23660 PRIMULA ARICULA $4.50 Thick, large blue-gray leaves, yellow flowering on 12 inch stems in April-May. 23655 RAOULIA AUSTRALIS $4.50 Very tiny leaved ground cover that looks like small gravel sprinkled on the soil. Marginally hardy. 23826 RUSCHIA CV. HOMATA $4.50 Very miniature and shrubby. 23825 RUSCHIA INDURATA $4.50 Miniature creeping and prostrate. 23824 RUSCHIA PULCHELLA $4.50 Creeping and prostrate. 23827 RUSCHIA PULTERELII $4.50 Very miniature and shrubby. 23657 SAXIFRAGA ROTUNDIFOLIA $4.50 Tufts of fleshy, kidney-shaped leaves with 14 inch starry white flowers in May-June, encrusted type. 23662 SAXIFRAGA "SPRITE" $4.50 Neat compact mounds producing carmine-pink flowers, encrusted type. 23663 SAXIFRAGA TRIFURICATA VARIEGATA $4.50 A nicely variegated form with very thready green leaves edged creamy white. 23760 SAXIFRAGA UMBROSA "ELLIOT'S VARIETY" $4.50 Tight green rosettes splashed with cream variegation sending up 4-6 inch stems bearing dangling rose-pink flowers in spring. 23667 SAXIFRAGA UMBROSA "LONDON'S PRIDE" $4.50 Very similar looking to S. "Elliot's Variety". 23652 SEDUM ACRE "GOLDEN ACRE" $4.50 Fine yellow-green carpet foliage. 23651 SEDUM ALBUM SSP. MICRANTHUM $4.50 Miniature form with white flowers and bronze-red, tiny foliage. 23747 SEDUM GLOBOSUM $4.50 Fat, roundish dark green beades. 23748 SEDUM "GOLD MOUND" $4.50 Mat forming yellow green foliage, small leaves. 23647 SEDUM "JOHN CREECH" $4.50 Very best ground cover only two inches tall with pink flowers in June. 23649 SEDUM LYDIUM $4.50 Tiny emerald green, ferny, evergreen foliage with white flowers in summer. 23749 SEDUM MAKINOI "LIMELIGHT" $4.50 Low growing plant with chartreuse foliage and yellow green flowers in summer. 23744 SEDUM PALLIDUM $4.50 Rare in cultivation producing pale blue-green linear leaves with long spreading stems of flowers in summer. 23644 SEDUM POPULIFOLIUM $4.50 One of the few sedums tolerant of shade. Forms 6-8 tree-like foliage with yellow flowers in the summer. 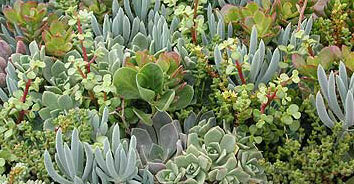 23646 SEDUM REFLEXUM $4.50 Low decumbent mats of fleshy gray-green. Yellow flowers in July. 23750 SEDUM RUBROTINCTUM "MINI ME" $4.50 A dwarf with blue-red jellybean-like foliage. 23745 SEDUM RUPESTRE $4.50 Blue spruce-like foliage with yellow flowers in summer. 23746 SEDUM SERPENTINI $4.50 Low growing and creeping with brown-red leaves and pink flowers in summer. Leafless in winter. 23648 SEDUM SEXANGULARE "WEISSE TETRA" $4.50 Six sided spiral shaped leaves, compact, turning copper color in the sun. 23650 SEDUM SPURIUM "ALBUM SUPERBUM" $4.00 White flowering Dragon's Blood. This list is in addition to what is listed in the catalog. Please check the web site to see what plants will not be offered from the 2002 paper catalog which is still being used and be sure to list substitutes. Remember, if you do not state that you do not wish to receive substitutes .... you might. 85788 SEMPERVIVUM ASSORTMENT $20.00 This assortment will be all unnamed. You will receive 25 pups about one inch in diameter, at least 5 different varieties to get your garden started. 23759 SEMPERVIVUM ASSORTMENT $35.00 You will receive an assortment of 10 different, all named, full sized plants, not single pups. 23628 SEMPERVIVUM "ALPINUS" $4.50 Red with green centers, medium sized. 23734 SEMPERVIVUM ARACHNOINEA CEBENSE $4.50 One of the largest cobweb types with chicks that grow on ling stolens. 23641 SEMPERVIVUM ARACHNOIDUM x PITTONII $4.50 Small spider web clusters. 23622 SEMPERVIVUM ARACHNOIDUM V. BRYOIDES $4.50 Very tiny balls covered with a heavy web that tools like wool. 23741 SEMPERVIVUM ARACHNOINEA "WEBBY FLAME" $4.50 Small growing webby clusters tinged in red. 23639 SEMPERVIVUM "BAGHDAD" $4.50 Tight green rosettes with gray sheen, reddish brown tips. 23640 SEMPERVIVUM "COLLEGE" $4.50 Ed Skrocki hybrid. Dark lipstick red and green. 23624 SEMPERVIVUM "DIRECTOR JACOBS" $4.50 Maroon violet leaves, large and showy. 23633 SEMPERVIVUM "FIMPRIATUM" $4.50 Bronze-green with hairy edges. 23735 SEMPERVIVUM "JUBILEE" $4.50 Many narrow velvet bordered in green, medium. 23630 SEMPERVIVUM "ODDITY" $4.50 Quill-shaped leaves that are green with purple tips, different looking. 23736 SEMPERVIVUM "LAVENDER AND OLD LACE" $4.50 Large open heads. Leaves are green and lightly tipped red. 23636 SEMPERVIVUM "OLIVETTE" $4.50 Gray-green leaves tipped with a hint of red, medium to large. 23626 SEMPERVIVUM "OTHELLO" $4.50 Strong red color, large growing. 23631 SEMPERVIVUM "PEKINESE" $4.50 Light green leaves that are furry and lightly webbed, medium growing. 23637 SEMPERVIVUM "PILOSELLA" $4.50 Medium green color. Small to medium semi-loose heads. 23738 SEMPERVIVUM "PURPLE PASSION" $4.50 Small to medium heads, semi-open with deep purple foliage and a hint of green in centers. 23629 SEMPERVIVUM "ROGIN" $4.50 Very red, medium sized. 23739 SEMPERVIVUM "ROYAL ASH" $4.50 Large growing green with gray. 23740 SEMPERVIVUM "ROYAL RUBY" $4.50 Large heads of fairly tight,, deep purple-red foliage. 23635 SEMPERVIVUM "SATURN" $4.50 Rings of green, pink and red, medium sized. 23638 SEMPERVIVUM "SHOWBERGER" $4.50 Medium to large heads of fairly open pale gray foliage. 23741 SEMPERVIVUM "STRAWBERRY FIELDS" $4.50 Lovely strawberry color, fine cilia on edges. 23632 SEMPERVIVUM TECTORUM $4.50 Rich green leaves tipped in purple, medium. 23627 SEMPERVIVUM "THAYNE" $4.50 Satin blue-green leaves with maroon flushed tips, small. 23743 SEMPERVIVUM "WOLCOTT'S VARIETY" $4.50 Silvery pink rosettes. 23654 STOMATIUM MULTILINIUM "TIGER JAWS" $4.50 Tiny blunt leaves with teeth, yellow flowers. Marginally hardy. 23763 VIOLA CORNUTA "PAINTED PORCELAIN" $8.50 Large flowers brushed in soft lilac with deeper central markings. 23762 VIOLA "DANCING GEISHA" $8.50 Silvery swirled, cut foliage with delicate fragrant blur flowers in mid-spring. 23761 VIOLA PEDATA "ECO ARTISTS PALETTE" $8.50 Each flower has shades of yellow, purple and white on a plant that grows just 3-4 inches tall, very different.